The church is open every day and we welcome all visitors to explore our building or to take time for rest or prayer: cards, booklets and resources are available for those who may be finding the challenges of life difficult to cope with. Information about the life of our church and the community in which it is closely involved, are on display with leaflets about forthcoming events. Please sign our visitors’ book. We offer child and family friendly services. We have a regular choir who welcome new members. Our bell ringing team also welcomes enquiries from experienced ringers or those wanting to learn the relaxing art of bell-ringing; a past-time that costs nothing and provides excellent social contacts. Although on the periphery of the village, the church is actively involved in all aspects of village life – from Brownies and Rainbows to Darby and Joan, from Steventon Choral Society to the Royal British Legion, Steventon Historical Group and sports and social events. A range of music and arts events are hosted by the church as well as events for village school age children. An annual church fete is held on the village green in August and the church maintains a high profile involvement at the TRUCK music festival for over 15,000 people which is held just 400 metres from the church. The church has an active bell ringing team led by Tower Captain, Claire Ward who can be contacted via send email. The six bells, to be refurbished in 2019, will then be in excellent working order and have a new rope guide inserted which makes ringing much easier for novice members. New members and those interested in finding out about bell-ringing are warmly welcomed to contact Claire. People who try bell-ringing find it both absorbing and relaxing, and there’s also the opportunity of earning small amounts, rather than expending large sums, on a pastime. The presence of a church in Steventon is mentioned in the Domesday Book (1086), but the existence of a place of worship in the village may well be much earlier. The church's dedication is to St Michael and All Angels, which often indicates very early origins and, perhaps, even connections with Celtic Christianity, and the presence of an ancient yew tree in the churchyard is sometimes associated with pagan sites (the one here is thought to be 1,200 years old). Steventon lay along the ancient route between Newbury and Oxford, and there is a mile-long ancient raised causeway, bordered by many existing fine mediaeval buildings. This may have been devised to provide a drier route for mediaeval traffic across marshy land, or as a dry path to the church on higher ground at the west end of the village. At the time it was constructed, the Manor was being administered as an outpost of the Abbey of Bec in Normandy by a Prior and one monk, living in the monastic grange; the present Priory Cottages at the corner of Mill Street and the Causeway. The original church of St Michael’s pre-dated this arrangement, and a priory church and associated buildings were never built. The last Prior left in 1379, in 1399 the manor was given to the Dean and Chapter of Westminster, who have remained Patrons of the Living. The church is unusual in that it has no chancel arch – the division between chancel and nave being marked by a break in the north wall. 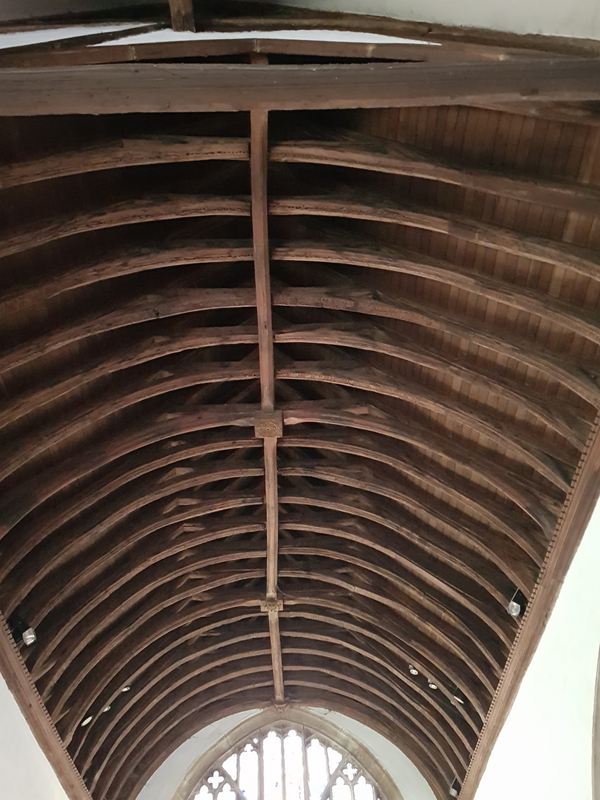 The trussed roof has curved ribs with interesting square bosses at intervals – including a carved mitre and queen’s head, a mermaid, a king’s head, and other subjects. The earliest part of the church is a column by the incumbent’s stall, dating from the 13th century, but the general appearance is 14th century, which suggests that it was substantially rebuilt either when the Prior of Steventon was both Lord of the Manor and Rector of Steventon, or by a Sir Hugh Calveley who leased or owned the manor between 1361 and 1394 (and who paid for the refurbishment with profits from military campaigns). 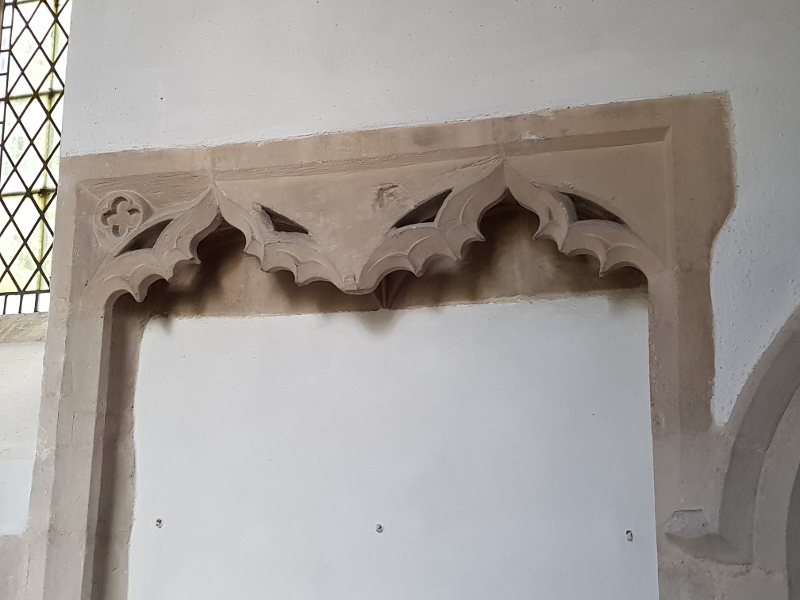 The fine stonework in the aisle windows and the great arch-braced roof, decorated with the fine series of carved bosses, dates from this period. The position of the tower is slightly unusual, on the south side of the nave, and combined with the porch. The south aisle is of 3½ bays, parallel to the chancel and the eastern part of the nave, having at its west end an arch into the bottom stage of the tower. The large windows at the east and west ends date from the early 15th century. In the chancel, the trefoil-headed piscina has a bracket at the back and a large rose masking the drain. There is an unusual 14th century double sedilia (stone seat) in the south side, which was abandoned by the mason with the decorative carving left unfinished. The tower has a ring of six bells, originally hung in wooden frames, and a Sanctus bell. In 1552 the Commissioners’ Inventories record ‘Stevington: three belles in the stepulle: A small belle: Sacringe belle: A burying belle’. William Yare of Reading cast the fourth and tenor bells in 1613. Henry I Knight, also of Reading, cast the second bell in 1617. Ellis II Knight and Henry III Knight cast the treble bell in 1674. William Taylor of Loughborough cast the third and fifth bells in 1849, presumably at their Oxford foundry. Rather unusually, the main entrance to the church is through the ground floor of the tower, which also serves as the ringing chamber, with three bell-ropes on either side of the entrance. New members joining the bellringing team ae very welcome. The furnishings in the chancel are 19th century, while some of the carved woodwork and pew ends in the nave are from the 15th and early 16th centuries. The original stained glass was sold to Bryant Barrett, the owner of Milton Manor, in 1772, for a considerable sum, and can still be seen in the chapel there. The large east window now has glass by Warrington (1833) depicting the seven Archangels, and the ten occasions on which angels are mentioned in the bible. 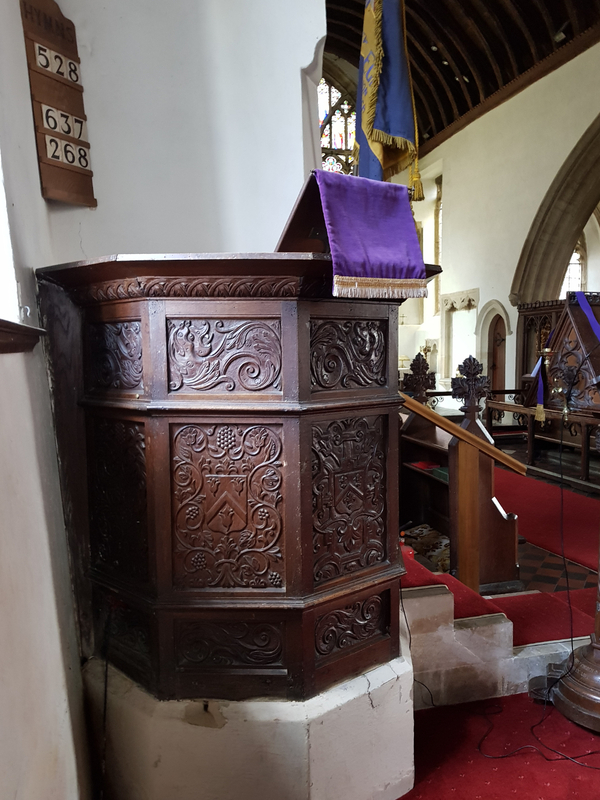 Among other interesting features are the handsome Jacobean wooden pulpit, and an alms-box dated 1633, with three compartments and three locks. There are also two brasses – one commemorating Richard Do (died 1476) and his two wives, and the other dedicated to Edward Wiseman, his wife (died 1584) and their eight children. 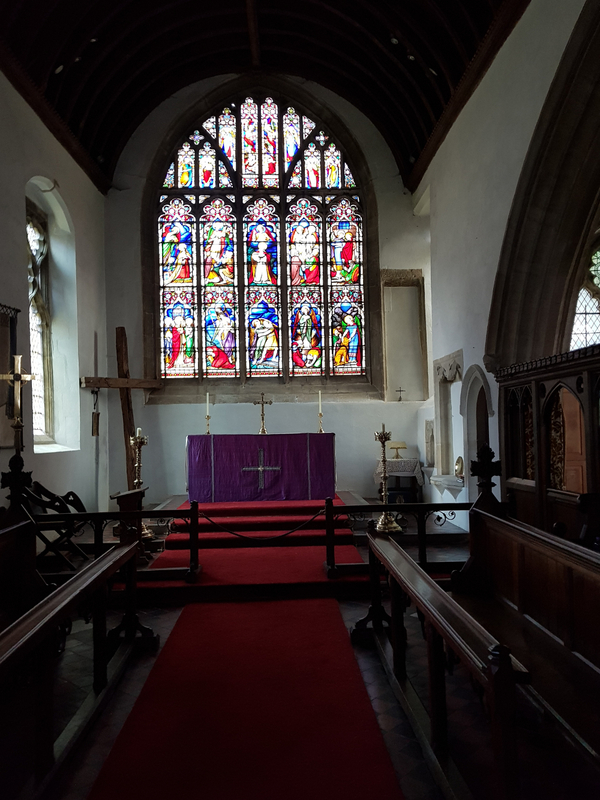 For comprehensive information on the church and the historic village of Steventon, copies of the second edition of The Story of Steventon are available from the Church, local stores in Steventon or by contacting the minister, the Revd Phil Sutton on send email.